I went back to Cuisine Cuisine (國金軒) tonight for a gathering with some friends. The central location was ideal, and it has been a few months since my last visit, and I wanted to give it another try. My friend brought along a bottle of 2005 Jean-Philippe Fichet Bourgogne Blanc. A flinty nose with mineral, grass and lemon citrus notes. Being from the fantastic 2005 vintage, the wine was ripe on the palate but a bit tart on the finish. 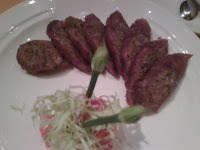 We started with deep-fried pig's intestine stuffed with glutinous rice (糯米炸釀大腸). Amazingly, my fellow Taiwanese friend didn't want any. I was somewhat surprised because the intestine was actually just a thin layer on the outside, rather than the thick and chewy ones that I am used to. This version was fairly similar to the glutinous rice sausage (糯米腸) that I would find at street markets in Taiwan, except that this is deep-fried instead of grilled. Roasted crispy duck breast served with blinis (層餅脆皮燒鴨胸) was definitely a fusion dish. 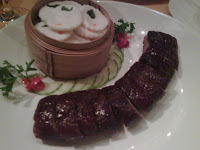 The duck breast was presented like one would expect in a typical French restaurant - magret de canard - except that it was prepared with Chinese spices and served with steamed Chinese blinis. The breast was well-done like the Chinese normally do, instead of being a little pink in the center as the French would do. I like it. The braised eel with pomelo peel (柚皮風鱔煲) came in a claypot that contained lots of veggies and tofu skin. I'm not a big fan of big eel, but the veggies with the starchy sauce were pretty good. 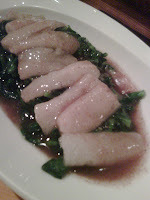 I really liked the braised seasonal vegetables with bamboo pith and shrimp roe sauce (蝦籽竹笙扒時蔬). The seasonal veggie now is pea shoots (豆苗) which were delicious. What really made the dish was the addition of shrimp roe in the starched sauce, which transformed the dish from something ordinary to make it stand out. Shrimp roe is one of my favorite ingredients in Cantonese cuisine, as it is so intensely flavorful. Yummy! Just when we were getting full from the rice, our final dish arrived. Pan-fried rice vermicelli with beef brisket in curry sauce (咖喱牛坑腩煎米粉) is a dish that I keep ordering here. Somehow I just really like the combination of the pan-fried vermicelli and the curry sauce. Greasy, yes, but delishhhh! I brought along a bottle of 1998 Denis Mortet Gevrey-Chambertin Combe-du-Dessus. I bought a case of this wine years ago and have had quite a few great bottles since, but this particular bottle needed a bit more coaxing - the bouquet didn't develop fully until almost 3 hours after opening. Nose of sweet strawberries and plum, with oriental spice, game meats and forest. Good body and structure here, and still a nice wine to drink. It's really unfortunate that Denis decided to commit suicide in 2006 after a long bout with depression.